Flavius Gratianus Augustus was Roman emperor from 367 to 383. He was the son of Emperor Valentinian I by Marina Severa, and was born at Sirmium. 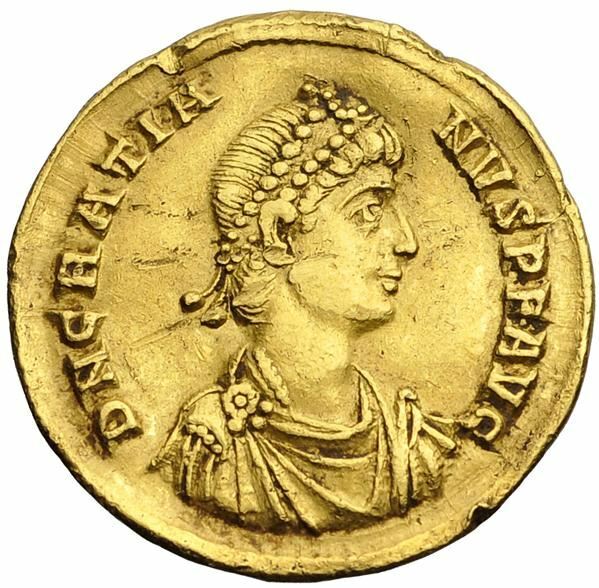 He ruled alongside his father from 367 to 375, alongside his brother Valentinian II from 375 to 379, and finally alongside Theodosius I from 379 to 383, as Augustus in the west. By using foreign bodyguards, and appearing in public in the dress of a Scythian warrior, he aroused the contempt and resentment of his Roman troops. A Roman general named Magnus Maximus took advantage of this feeling to invade Gaul with a large army. Gratian was deserted by his troops, and fled from Paris to Lyon. The governor of Lyon delivered Gratian to one of the rebel generals, Andragathius, and he was assassinated on 25 August 383.